Karma Network | Stephen Kisker: "Renewable energy almost sells itself." Stephen Kisker: "Renewable energy almost sells itself." Investing in renewable power sources is one of the most popular ways to introduce impact investment strategies into client portfolios. As a sub-sector of energy, renewables are growing both in the percentage of power generated compared with fossil fuels, but also in terms of capital raised. But this is also a complex industry. Just because your neighbor has decided to put a wind turbine in the backyard doesn’t make it a good investment. Trade friction, labor costs, state and federal jurisdictional disputes, and scientific challenges like grid intermittency and battery storage limitations its best to move forward with expert advice. 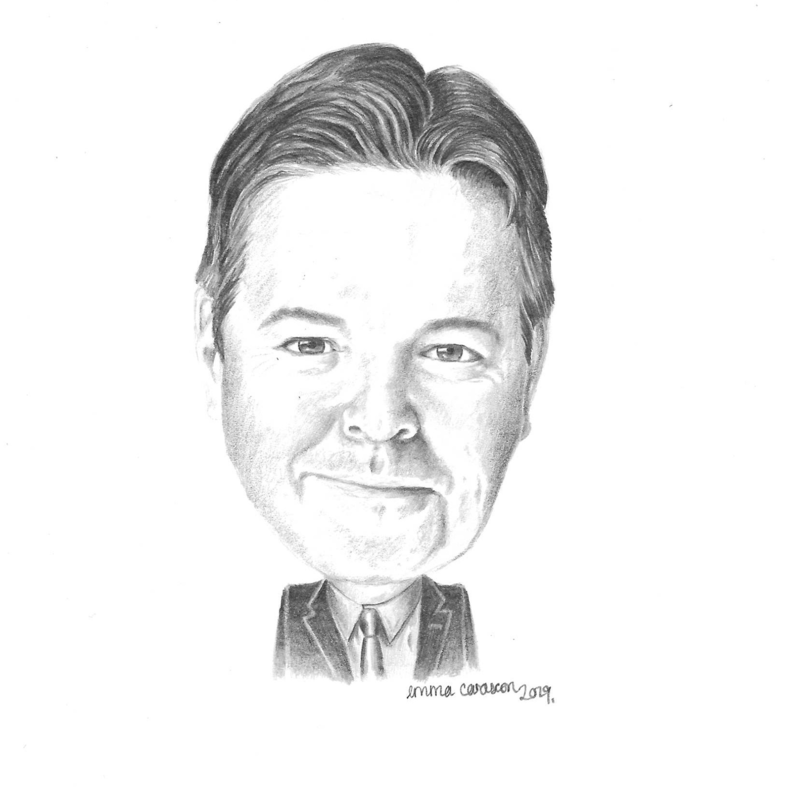 Stephen Kisker is a New Jersey-based attorney who has navigated this terrain for the past decade as the chairman of the renewable energy and sustainability group at his law firm, Chiesa Shahinian and Giantomasi (CSG Law). He spoke to Karma’s Contributor Editor, Michael Moran about the macro factors that make renewable energy investments more complex than nonrenewable counterparts. Michael Moran: How are global and local politics going to affect renewable energy? Stephen Kisker: Global and local politics greatly affect renewable energy in many ways. Starting with global politics, the most prominent thing happening now is the trade war going on between the United States and other countries, particularly China. The cost of installing equipment needed to generate renewable energy has increased quite a bit recently due to 30% tariffs on imported solar panels and solar modules and a 25% tariff on imported steel. Most of the modules that are important and frankly most of the steel that's imported in solar renewable energy projects comes from overseas. There are 14 U.S.-based companies currently manufacturing solar panels, the biggest ones being SolarWorld and SunPower, but they are only a small fraction of the market. The tariffs are driving up the cost of renewable energy, and of course the more expensive the equipment is, the more expensive it's going to be to get the electricity out of it. I've been involved in renewable energy, specifically solar, and when I started doing solar projects ten years ago, the installation cost was about $8 a watt. Today, we're down between $2-$3 a watt depending on your project, how big economy of scale, that type of stuff and it continues to drop. But because of the tariffs, [the cost per watt] is dropping a lot slower now than it would have without tariffs. Michael Moran: What about the impact of local politics? You have 50 different state laws just in the U.S. How do these jurisdictions complicate things? Kisker: Not only is there a global or national impact on what's going on, but there's also a local impact because of local regulations. Most renewable energy projects, specifically wind and solar, are very heavily dependent on two things locally. When I say locally it can be as local as a municipality or you can be talking about a state or a county. Number one are incentives. There are federal incentives which apply to everything. There are Solar Investment Tax Credits (ITCs), depreciation, that type of stuff, which will apply to any renewable energy project in the country. But there are also local incentives at each individual state. For instance, New Jersey, Massachusetts and other states have solar renewable energy credits for solar or offshore wind recs for offshore wind. These are tradable credits that you can sell for generating renewable energy and those can add a very substantial income stream to a project. If you're in a state that has those advantages, that's great. if you're in a state that doesn't, you can still make it work, but it's harder to make the deals pencil out, especially when you’re in an environment like the Northeast U.S., where solar there isn’t the same amount of sun radiation as Arizona and Nevada. So you can do a project in Arizona relatively easily without an additional incentive, but it's difficult to do it in Massachusetts or New Jersey because the solar resource is about 30% less in those states. There are also micro complications locally — an individual town or municipality, depending on what you're installing, will frequently require land use approvals and permits. Some municipalities are very friendly to changing zoning or giving you site plan approval to build a project. Others, not so much. 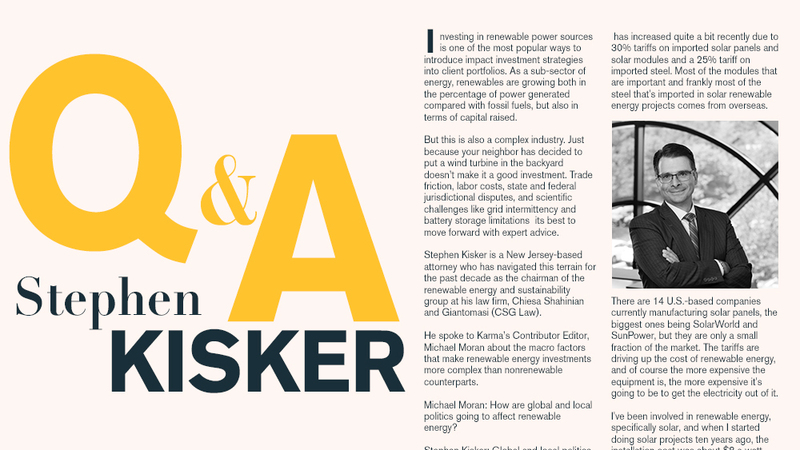 Michael Moran: How do you introduce the concept of renewable energy as a viable option to your clients? Kisker: Renewable energy almost sells itself. It's very easy to introduce the topic and discuss it with just about any one of my clients. Everybody who uses energy or who invests money can benefit from a renewable energy project one way or another. They can either invest in it if they have cash to invest or they can invest in a project, which is terrific. They can get a nice rate of return, or if they're a user of electricity they can either buy a renewable energy system directly and install it on their property and using the energy from it that will reduce their energy costs. It will also give them the added benefit of reducing their carbon footprint. You know, whether or not one subscribes to global warming or climate change or not, we can all agree that if we reduce our carbon footprint it's not a bad thing. You can also help with energy independence, because we're generating our own electricity right where you consume it. When you do a renewable energy system on site, or do a small power plant that's a renewable energy power plant, clearly you're not importing the energy or the electricity, or the raw materials, whatever it may be, from somebody on the other side of the globe who may not like us too much. Michael Moran: What are the latest technological advances that are increasing efficiencies and reducing renewable energy costs? Kisker: The biggest boosts comes from the entry of more manufactures of renewable energy equipment, which is reducing costs. Take solar as an example. Efficiency now is generally between 15% to 22%, meaning that is the proportion of sunlight being converted by into electricity. The highest efficiency panels in the market now being about 30%. We expect to see that continue to rise. Some researchers are getting up to 46% efficiency, but they haven't been able to get that out in the mainstream market yet. But going from 15% even to 22%, to 30% up to 46% makes a huge difference. That’s coming soon. So that means you can quadruple, maybe even more, the amount of electricity that's generated for each dollar spent in a renewable energy project. Inverters, which convert solar energy to AC or DC power, also are becoming much less expensive. There is a loss of electricity or loss of energy in that transfer from photovoltaic to AC/DC. Ten years ago when I started this was about $8 a watt. As I mentioned, we’re now down to $2 to $3 per watt. So today even with the trade tariffs, you can install a system between $2 and $3 a watt on an economy of scale. If you're doing a big project, in the right, spot you can probably dip below $2 a watt. Michael Moran: What about battery storage and the problem of intermittency that current technologies have not yet solved. Isn’t this is a big hurdle for integrating renewables into the power grid? Kisker: One of the big problems with renewable energy, whether it's solar, wind or is that they are intermittent. It's not a steady energy source using solar for example or wind. The two easiest ones to harness are solar and wind. But the sun is not out all the time and the wind won’t always blow. So the last piece of the puzzle is the holy grail for renewable energy and that's battery storage. All renewable energy is intermittent. It doesn't generate the same amount of electricity all of the time. If you're relying on a natural energy resource that isn’t always available you still need to rely on presumably a fossil fuel source. Or some other on-demand source where you can flip the switch and get energy when you need it. The other issue is if you're generating too much energy at any given time, there is a great risk that it will be wasted. An unexpected wind gust, for instance, or for solar a big cloud comes over and blocks the solar panels, there would be big surges and drops in and that affects grid stability. So what you need is battery storage that will allow you to pump into a battery, which will serve as a kind of a regulator or reservoir. It Batteries, many of them lithium ion, remain very expensive. You still don't see see battery storage in most projects because of the cost. You see them in some projects, but I would guess it’s nowhere near 50% at this point. But as battery technology gets better, the batteries shrink in size and batteries get less expensive, it will make a huge difference for renewable energy projects. Michael Moran: What are elements of renewable energy projects that draw investors, and what markets are going to be created as we see the rise of clean energy adoption? Kisker: The most lucrative elements of renewable energy projects can be broken down into two major categories. The first is jobs plain and simple. This is a whole new sector of jobs that didn't exist before with over 10 million people employed in the clean energy sector worldwide. In 2018, 2.8 million of those jobs were in the United States. So the jobs are obviously an economic driver and also at least right now there are a lot of tax benefits which make it very lucrative to put together a renewable energy project. The second aspect are available tax benefits. There's a 30% federal investment tax credit (ITC) that is in effect through 2019 and then it gradually dips before it settles down at 10% over the course of three years.